View Esphyr Slobodkina’s art throughout her lifetime, beginning in the 1920s. Born on September 22 in Chelyabinsk, Siberia, to Itta L’Vovna Agranovich Slobodkina, a dressmaker, and Solomon Aronovich Slobodkin, manager of MAZUT, the town’s oil yard. Youngest of five children. Illness and sudden death of oldest brother, Yasha. Family moved to Ufa, Russia when father received a promotion. Revolution and beginning of Russian Civil War. 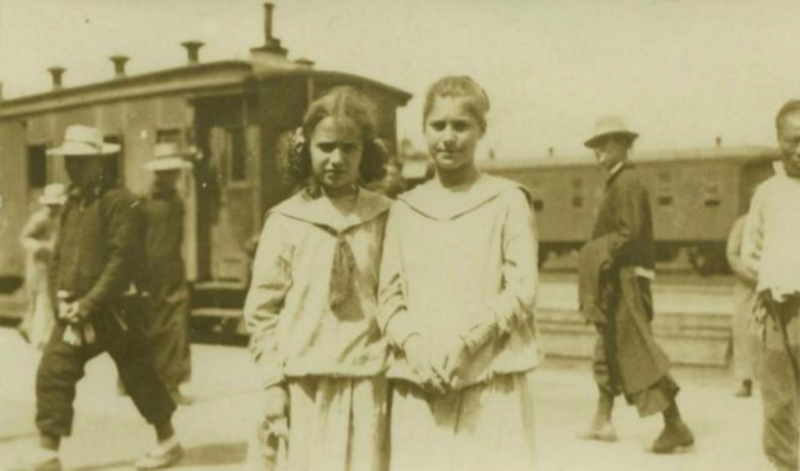 Slobodkina and her sister Tamara at the train station in Harbin en route to Vladivostok, May 1919. Trans-Siberian Express. Living as refugees, the Slobodkina family became impoverished and struggled for survival. Desperate to make money, Slobodkina, along with mother and sister, moved to Harbin, Manchuria. Mother’s establishment of dressmaking salon. Madame Slobodkina (center, polka-dot dress) with her workforce in front of her Harbin dress shop, c. 1921. Family reunited in Harbin. Slobodkina entered a co-ed junior high school (IInd Realnoye Uchilische) that stressed mathematics and art. Aspiration to become an architect. Private art tutoring from the impressionist painter Pavel Goost. Designed embroidery for mother’s dressmaking salon. Fell ill with the measles and spent six weeks in quarantine. Emigration of brother Ronya to America. Transferred to the Kommercheskoye Uchilische, a schooloriented toward business. Graduated in 1927. Emigration to New York in January to join brother and study art. Enrolled at the National Academy of Design, but felt stifled by its conservatism. Found solace in her composition class taught by the accomplished muralist Arthur Sinclair Covey. Example of Slobodkina’s student work at the National Academy of Design. Mother arrived in New York about one month before the stock market crash. Unable to find employment, opened her own dressmaking salon and hired Slobodkina as an assistant. Emigration of sister Tamara to New York, who also attended the National Academy of Design. Slobodkina received an honorable mention from the Academy for her well-composed Autumnal Procession. 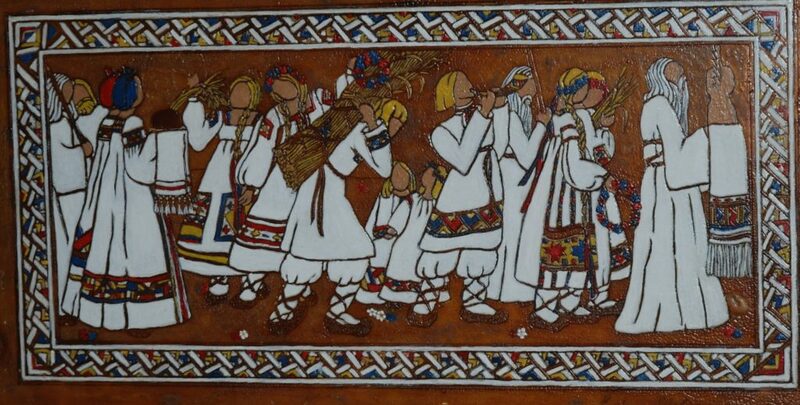 “Autumnal Procession in Ancient Russia,” c.1929-30, oil on etched shellac-coated glass, Heckscher Museum of Art. Emigration of father to New York. Met Ilya Bolotowsky, whose work she had noticed in composition class. Courted by Ilya Bolotowsky, who had just returned from Europe. He also became her artistic mentor. 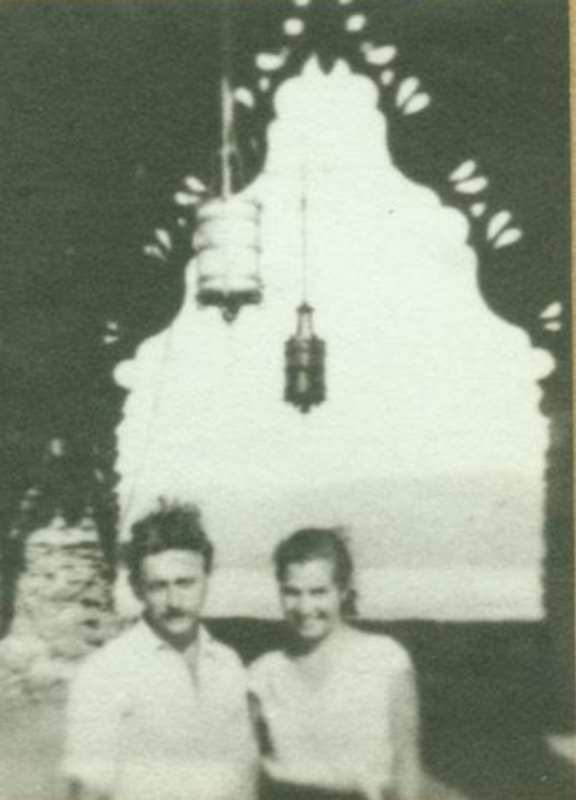 Ilya Bolotowsky and Slobodkina at Yaddo, 1934. Marriage to Bolotowsky in the summer on a farm near High Bridge, New Jersey. Now an American citizen, she was able to quit the National Academy. Active member of the Artists’ Union. Residency at Yaddo, an artist colony in Saratoga Springs, New York, from August 30 to around December 25. Exploration of Post-Impressionism. n Clifton, New Jersey, with the polychrome textile printing process. Lived in Clifton with family during the week and visited her husband on weekends. First Cubist-inspired painting based on her Clifton apartment bathroom (The Sink). 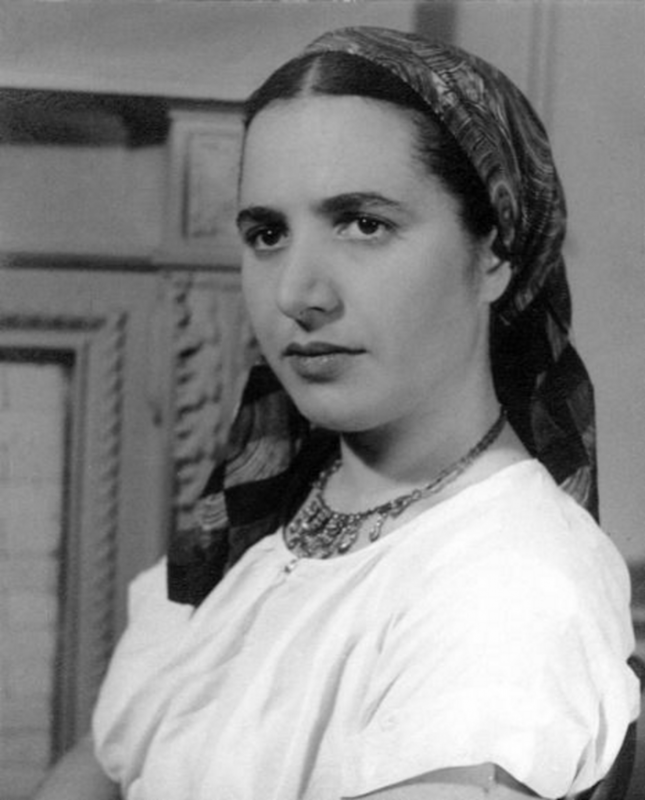 Employment with the Federal Art Project of the Works Progress Administration as an assistant to Hananiah Harari. Separated from Bolotowksy and officially divorced in 1938. 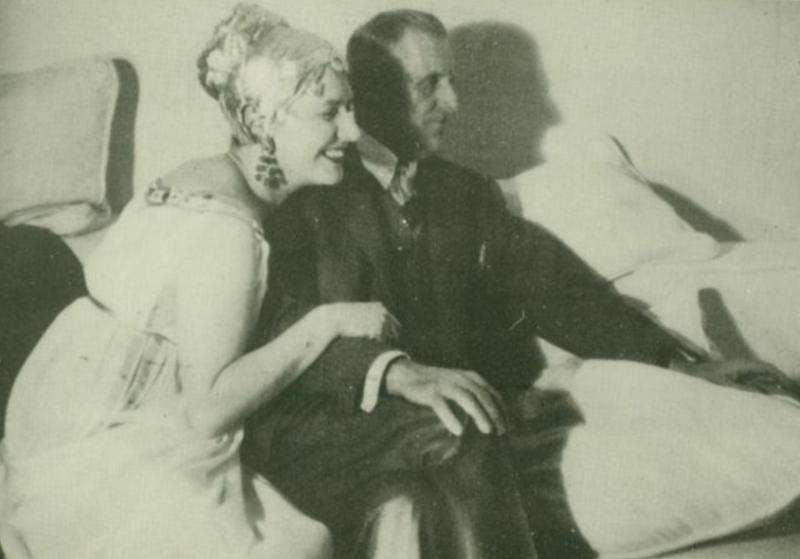 However, the two remained close friends through the late 1940s. Founding member of the American Abstract Artists. Vacation on Monhegan Island, Maine where she painted stylized boats, fishermen, and nautical equipment. 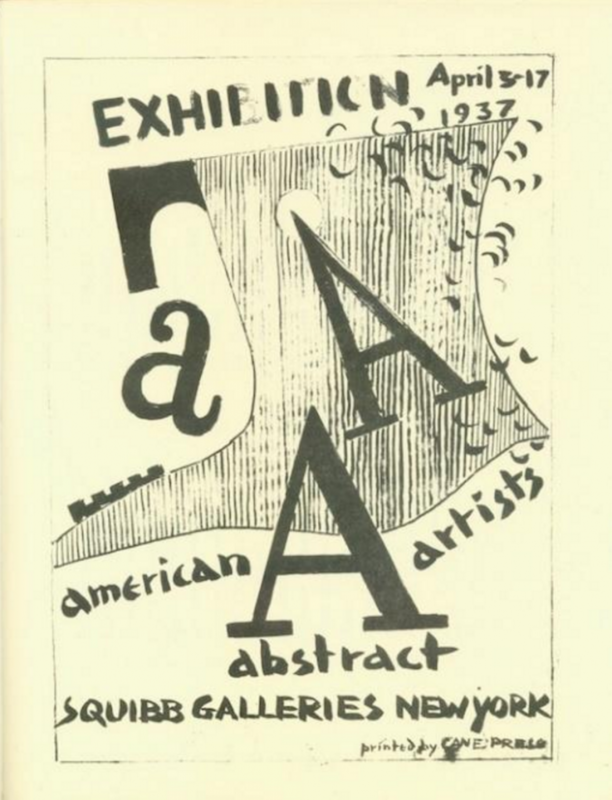 Cover from the AAA’s first exhibition catalog, Squibb Galleries, 1937. Began working in Paterson, New Jersey, as head designer and supervisor of the polychrome process at Arrow Textile Print Works, Inc. (closed ca. 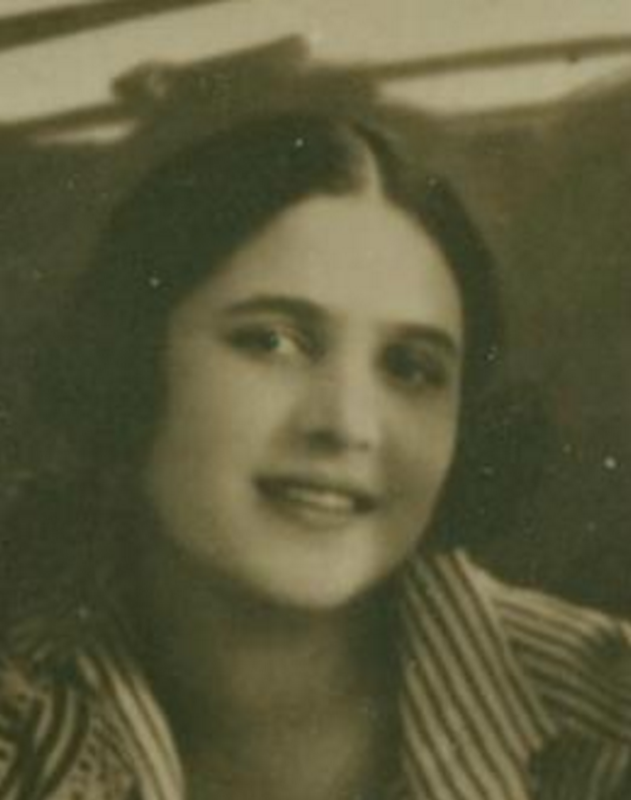 1941). “American Abstract Artists 1st Annual Exhibition,” Squibb Galleries, New York, NY, April 3–17. Beginning of career as a children’s book illustrator with the publication of The Little Fireman (written by Margaret Wise Brown and illustrated by Esphyr Slobodkina). Sudden death of her father. Moved with mother to 108 East 60th Street. Here, Slobodkina’s mature abstract style began to evolve as evidenced by Abstraction with Red Circle and Mural Sketch No. 1. Adoption of oil on gesso technique. Entered a gesso work, entitled Painting (now known as Boat Abstraction), in the American Abstract Artists 2nd annual exhibition. “American Abstract Artists 2nd Annual Exhibition,” American Fine Arts Galleries, New York, NY, February 14–28. “15 Abstractions by Esphyr Slobodkina,” New School for Social Research, New York, NY, November 1–15 (first solo exhibition). “American Abstract Artists 3rd Annual Exhibition,” Riverside Museum, New York, NY, March 7–28. Joined the newly-formed Federation of Modern Painters & Sculptors. 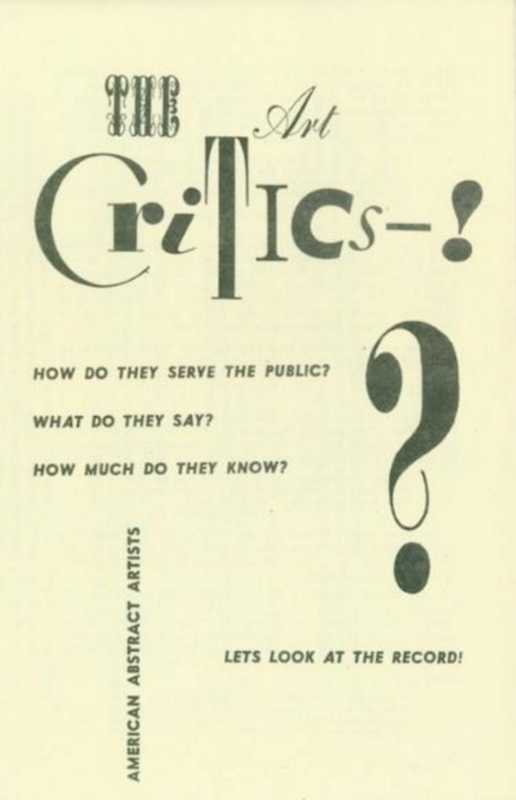 Cover of the critical pamphlet handed out during the AAA’s fourth annual exhibition in June 1940. Picketed the Museum of Modern Art with fellow American Abstract Artists members. Received a scholarship for paint supplies from the Guggenheim Foundation. 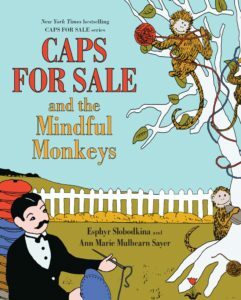 Publication of the children’s book Caps for Sale, which has since become a recognized classic. Slobodkina both wrote and illustrated this book. Orange Abstraction exhibited at the New York World’s Fair with the Federation of Modern Painters & Sculptors in the American Art Today Pavillon in June. This work was later painted over to make Ancient Sea Song. “American Abstract Artists 4th Annual Exhibition,” American Fine Arts Galleries, New York, NY, June 5–16. “American Abstract Artists 5th Annual Exhibition,” Riverside Museum, New York, NY, February 9–23. Slobodkina wearing a polychrome silk scarf of her own design. Photograph by Friz Glarner, 1941. “Federation of Modern Painters & Sculptors 1st Annual Exhibition,” Riverside Museum, New York, NY, March 9–23. Met businessman and future husband William L. Urquhart at the American Abstract Artists 6th annual exhibition. Started Manhattan-based polychrome printing business, known as the Art Development Company (closed around 1948). Launched American Abstract Artists lecture series at Nierendorf Gallery and active as Assistant Treasurer of the American Abstract Artists. Entertained Mondrian in her home. “American Abstract Artists 6th Annual Exhibition,” Fine Arts Galleries, New York, NY, March 9–23. “Federation of Modern Painters & Sculptors 2nd Annual Exhibition,” Wildenstein & Co., Inc. Galleries, New York, NY, May 21–June 10. Included in group show of 25 abstract painters at A.E. Gallatin’s Museum of Living Art, June–July. Exhibited Composition, which Gallatin subsequently purchased. “Esphyr Slobodkina: Recent Painting and Sculpture,” Museum of Living Art, December 7, 1942–January 13, 1943. “Exhibition by 31 Women,” Art of this Century, New York, NY, January. Jurors included Marcel Duchamp and Max Ernst. “American Abstract Artists 7th Annual Exhibition,” Riverside Museum, New York, NY, March 16–April 5. “Federation of Modern Painters & Sculptors 3rd Annual Exhibition,” Wildenstein & Co., Inc. Galleries, New York, NY, June 3–26. “Small in Size,” an exhibition by the Federation of Modern Painters & Sculptors, Gallery of Modern Art, New York, NY, October 25–November 13. Became office manager of William L. Urquhart’s export business (until 1956). 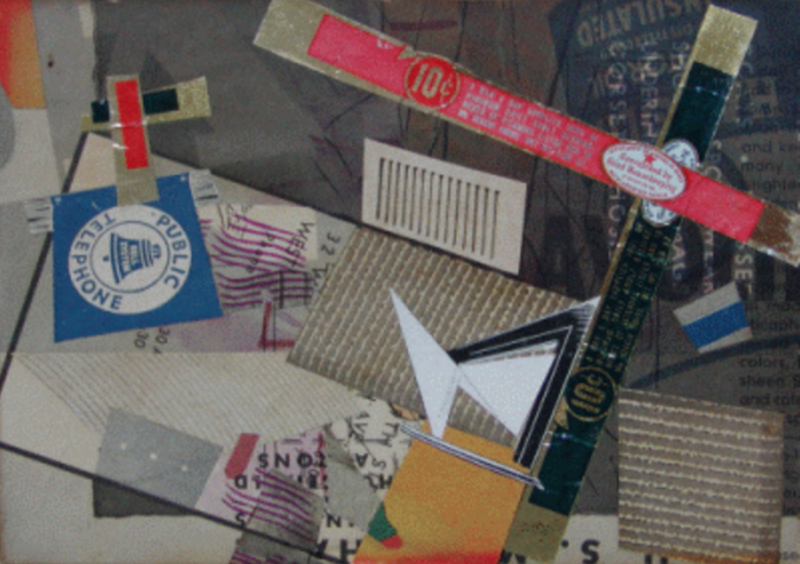 Used everyday office materials, such as bills and stamps, to create several collages including Crossroads and The Spangles. “Federation of Modern Painters & Sculptors 4th Annual Exhibition,” National Arts Club, New York, NY, March 14–31. “American Abstract Artists 8th Annual Exhibition,” Mortimer Brandt Gallery, New York, NY, March 27–April 8. Secretary of the American Abstract Artists (until ca. 1960). “American Abstract Artists 9th Annual Exhibition,” Riverside Museum, New York, NY, March 11–15. “Eight by Eight: American Abstract Painting Since 1940,” Philadelphia Museum of Art, Philadelphia, PA, March 7–April 1 and the Institute of Modern Art, Boston, MA, April 16–28. Included in Ad Reinhardt’s cartoon “How to Look at Modern Art in America,” published in PM, June 2, 1946. “How to Look at Modern Art in America” by Ad Reinhardt. Originally published in PM, June 2, 1946. “American Abstract Artists 10th Annual Exhibition,” American British Art Center, New York, NY, March 25–April 13. “Federation of Modern Painters & Sculptors 6th Annual,” Wildenstein & Co, New York, NY, September 18–October 5. “Exhibition of Sculpture and Drawings by the Federation of Modern Painters & Sculptors,” Chinese Gallery, New York, NY, December 7–30. Group show at Norlyst Gallery, December. Group show at Betty Parsons Gallery with Alfonso Ossorio, Ad Reinhardt, and others, December. “American Abstract Artists 11th Annual Exhibition,” Riverside Museum, New York, NY, March 20–April 20. “Esphyr Slobodkina,” Norlyst Gallery, New York, NY, April 12–May 3. Moved to Great Neck, New York, with her mother. Designed a studio for the new home, reviving her interest in architecture. “Tangents,” Norlyst Gallery, New York, NY, May 2–9 (solo exhibition). “American Abstract Artists 12th Annual Exhibition,” Chinese Gallery, New York, NY, May 29–June 18. “Federation of Modern Painters & Sculptors 8th Annual Exhibition,” Wildenstein Galleries, New York, NY, September 14–October 2. “American Abstract Artists 13th Annual Exhibition,” Riverside Museum, New York, NY, March 29–April 17. “American Abstract Artists 14th Annual Exhibition,” New School for Social Research, NY, March 15–31. “1950 Annual Exhibition of Contemporary American Painting,” Whitney Museum of American Art, New York, NY, November 10–Decemer 31. Exhibited Elements of Music. “Federation of Modern Painters & Sculptors Exhibition of Small Oils and Sculpture,” New School for Social Research, New York, NY, November 12–December 3. “Creative Art Associates,” Riverside Museum, New York, NY, December 3–22. American Abstract Artists show at Galeria Nazionale D’Arte Moderna, Rome, Italy, December. 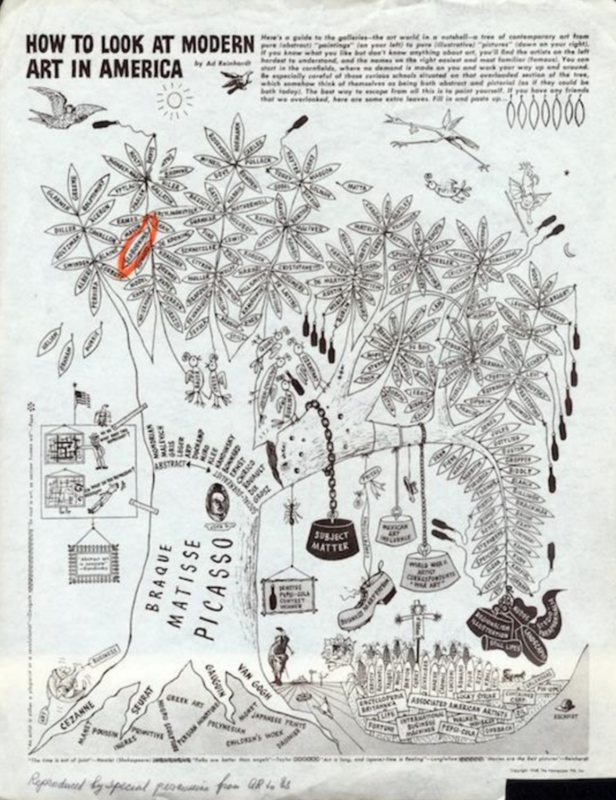 Included in Ad Reinhardt’s “Imaginary Museum,” published in Art d’Aujourd’hui,June 1951. “American Abstract Artists 15th Annual Exhibition,” Riverside Museum, New York, NY, March 12–April 4. “Paintings by Esphyr Slobodkina,” New School for Social Research, New York, NY, March 19–31. American Abstract Artists Show at Galerie Karin Hielscher, Munich, Germany, March 21–April 30. “Federation of Modern Painters & Sculptors 11th Annual Exhibition,” National Arts Club, New York, NY. “1951 Annual Exhibiton of Contemporary American Painting,” Whitney Museum of American Art, New York, NY, November 8, 1951–January 6, 1952. Exhibited Abstraction with Black Shape (ca. 1945–51, Private Collection). “Creative Art Associates, 6th Annual Exhibition,” Riverside Museum, New York, NY, December 2–23. “American Abstract Artists 16th Annual Exhibition,” New Gallery, New York, NY, February 24–March 13. “Federation of Modern Painters & Sculptors 12th Annual Exhibition,” National Arts Club, New York, NY, September. “1952 Annual Exhibition of Contemporary American Painting,” Whitney Museum of American Art, New York, NY, November 6, 1952–January 4, 1953. 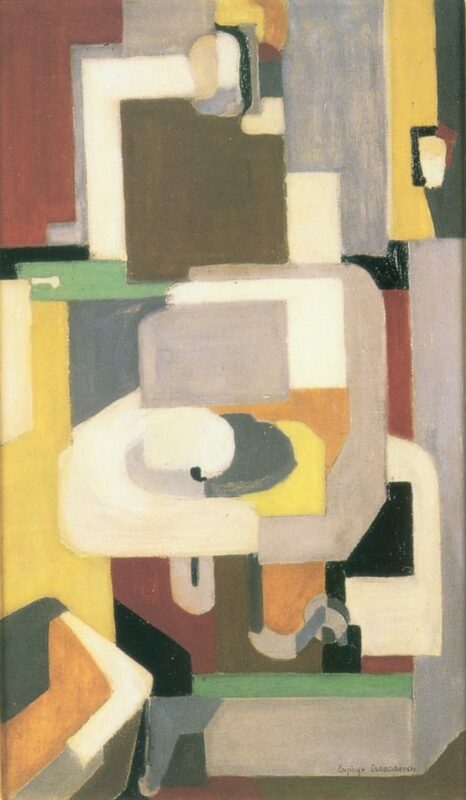 Exhibited Composition with White Ovals, which the Whitney subsequently purchased. Summer trip to Italy and France. “American Abstract Artists 17th Annual Exhibition,” Artists Equity Association, New York, NY, January 10–February 14. “Federation of Modern Painters & Sculptors 13th Annual Exhibition,” Riverside Museum, New York, NY, January 10–31. “The Classic Tradition in Contemporary Art,” Walker Art Center, Minneapolis, MN, April 24–June 28. “1953 Annual Exhibition of Contemporary American Painting,” Whitney Museum of American Art, New York, NY, October 15–December 6. Exhibited Flight (ca. 1953, Corcoran Gallery). “Federation of Modern Painters & Sculptors 14th Annual Exhibition,” Riverside Museum, New York, NY, January. “Slobodkina,” John Heller Gallery, New York, February 15–March 6. “American Abstract Artists 18th Annual Exhibition,” Riverside Museum, New York, NY, March 7–28. “1955 Annual Exhibition of Contemporary American Painting,” Whitney Museum of American Art, New York, NY, January 12–February 20. Exhibited Blue Abstract(current location unknown). “American Abstract Artists 19th Annual Exhibition,” New School for Social Research, New York, NY, February 28–March 21. “Federation of Modern Painters & Sculptors 15th Annual Exhibition,” Riverside Museum, New York, NY November 13–December 4. “American Abstract Artists 20th Annual Exhibition,” Riverside Museum, New York, NY, April 8–May 20. “Federation of Modern Painters & Sculptors 16th Annual Exhibition,” Riverside Museum, New York, NY, November. Residency at Yaddo in September for two weeks. “American Abstract Artists 21st Annual Exhibition,” The Contemporaries Gallery, New York, NY, April 22–May 11. Residency at the MacDowell Colony in Peterborough, NH from February 27–March 25 and September 15–October 15. Won the Lewis Carroll Shelf Award for Caps for Sale. “American Abstract Artists 22nd Annual Exhibition,” Riverside Museum, New York, NY, March 2–30. “1958 Annual Exhibition of Contemporary American Painting,” Whitney Museum of American Art, New York, NY, November 11–January 4, 1959. “Federation of Modern Painters & Sculptors 18th Annual Exhibition,” Riverside Museum, New York, NY, November. “Esphyr Slobodkina: Paintings and Collages,” New School, New York, NY, December 2–17. “Federation of Modern Painters & Sculptors 19th Annual Exhibition,” Riverside Museum, New York, NY, March.“American Abstract Artists 23rd Annual Exhibition,” Betty Parsons Gallery, New York, NY, June 1–13. Marriage to William L. Urquhart. Slobodkina with William Urquhart at a costume ball, c. 1955. Taught private painting classes in Great Neck, NY. Treasurer and Vice-President of the American Abstract Artists until 1963. “American Abstract Artists 24th Annual Exhibition,” Riverside Museum, New York, NY, February 28–March 27. “Federation of Modern Painters & Sculptors 20th Annual Exhibition,” Riverside Museum, New York, NY, October 30–November 27. “American Abstract Artists 25th Annual Exhibition,” Lever House, New York, NY, April 3–21. “Federation of Modern Painters & Sculptors 18th Annual Exhibition,” Riverside Museum, New York, NY, November 12–December 10. “American Abstract Artists 26th Annual Exhibition,” IBM Gallery, New York, NY, February 5–24. “An Exhibition of Work by Itta and Esphyr Slobodkina, Chase Manhattan Bank, Great Neck, NY, December 10, 1962–January 7, 1963. Death of second husband, William L. Urquhart. Elected President of American Abstract Artists (until 1966). “American Abstract Artists 27th Annual Exhibition,” East Hampton Gallery, New York, NY, May 7–June 1. “American Abstract Artists 28th Annual Exhibition,” Loeb Student Center, South Gallery, New York University, NY, January 8–23. “Federation of Modern Painters & Sculptors 23rd Annual Exhibition,” Lever House, New York, NY, January 12–26. “Federation of Modern Painters & Sculptors 24th Annual Exhibition,” Lever House, New York, NY, January 10–24. “American Abstract Artists 29th Annual Exhibition,” Riverside Museum, New York, NY, March 14–April 25. Chairman of American Abstract Artists Publications Committee. Responsible for the publication and design of American Abstract Artists 1936 –1966. “Federation of Modern Painters & Sculptors 25th Annual Exhibition,” Union Carbide Exhibition Hall, New York, NY, January–February 1. “American Abstract Artists 30th Anniversary Exhibition, Yesterday and Today 1936–1966,” Riverside Museum, New York, NY, September 25–November 27. Designed a house for sister Tamara in Great Neck, NY (completed in 1972). “American Abstract Artists,” Loeb Student Center, New York University, NY, July 10–August 7. 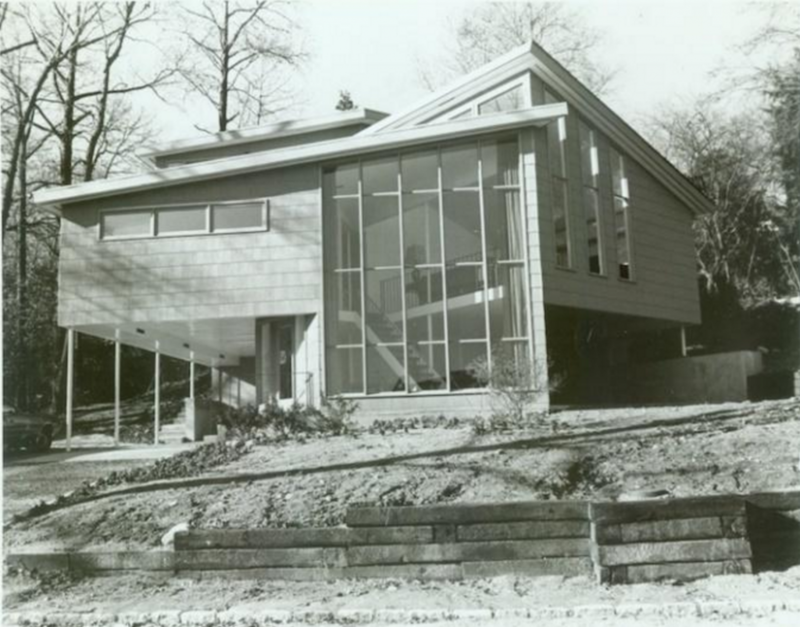 Exterior view of the house that Slobodkina designed for her sister in Great Neck, NY, c. 1972. Photograph by Connie Brukin. “Federation of Modern Painters & Sculptors 27th Annual,” Riverside Museum, January 14–February 19. “Federation of Modern Painters & Sculptors,” Union Carbide Exhibition Hall, New York, NY, September 16–October 11. “American Abstract Artists 32nd Anniversary Exhibition,” Riverside Museum, New York, NY, October 6–December 1. “American Abstract Artists,” North Carolina Museum of Art, Raleigh, NC, February 9 –March 9. Created a collage mural based on Pezzo the Peddler and the Circus Elephant for the University of Southern Mississippi Library, Hattiesburg, MS.
“American Abstract Artists,” Loeb Student Center, New York University, NY, February–April 16. “Federation of Modern Painters & Sculptors,” Loeb Student Center, New York University, New York, NY, December 14, 1970–January 14, 1971. “American Abstract Artists 36th Annual Exhibition,” Contemporary Arts Gallery, Loeb Student Center, New York University, NY, October 31–November 22. Federation of Modern Painters & Sculptors, Union Carbide Exhibition Hall, New York, NY, March 15–30. Summer trip to Northern Europe. “American Abstract Artists,” Betty Parsons Gallery, New York, NY, July–August. Began writing a three-volume autobiography, entitled Notes for a Biographer(completed in 1983). “Ten Year Retrospective Exhibition Commemorating the 35th Year Anniversary of the Federation of Modern Painters & Sculptors,” Union Carbide Exhibition Hall, New York, NY, October 1–20. “Eight by Eight: American Abstract Painting Since 1940,” Washburn Gallery, New York, NY, October 1–25. “American Abstract Artists Exhibition in Honor of Josef Albers, George L. K. Morris, I. Rice Pereira, Charles Shaw,” Westbeth, NY, October 2–28. “Federation of Modern Painters & Sculptors 35th Annual Exhibition,” Bronx Museum of the Arts, Bronx, NY, October. “American Abstract Artists,”Art Museum, University of New Mexico, Albuqerque, NM, February 27–April 3. “Federation of Modern Painters & Sculptors Exhibition,” Nassau Community College’s Firehouse Gallery, Garden City, NY. Moved to Hallandale, FL with mother. “Paintings & Other Things by Esphyr Slobodkina,” Hollywood Art Museum, Hollywood, Florida, April 1–24. Solo exhibition at the Hollywood Art Museum in January. “Artists’ Equity,” Broward County Chapter exhibition, Hollywood Museum of Art, Hollywood, FL, February. “American Abstract Artists: The Language of Abstraction,” Betty Parsons Gallery and Marilyn Pearl Gallery, New York, NY, June 19–August 3. Group show at Sid Deutsch Gallery, New York, NY, June. “Esphyr Slobodkina: Abstract Paintings of the 30’s and 40’s,” Sid Deutsch Gallery, New York, NY, January 5–February 2. “American Abstract Artists: The Early Years,” Sid Deutsch Gallery, New York, NY, March 1980–April 1981. “Transitions (American Abstract Artists),” Summit Art Gallery, Summit, NJ, March 6–31. “American Abstract Artists: Abstraction in Action (dedicated to Ilya Bolotowsky),” City Gallery, Department of Cultural Affairs, New York, NY, January 6–28. “In Celebration of Age: Twentieth Century Artists In Their Seventies and Eighties,” Francis Olfson Art Gallery, New World Center Campus, Miami-Dade Community College, Miami, FL, March 8–April 16. “Esphyr Slobodkina,” Sid Deutsch Gallery, New York, NY, May 1–29. “Esphyr Slobodkina: Paintings and Collages,” Hallandale Branch Library, Hallandale, FL, November 1–30. “Modern Masters: Women of the First Generation,” Mabel Smith Douglass Library, at Rutgers University, New Brunswick, NJ, December 1–21. “American Abstract Artists,” Weatherspoon Art Gallery, University of North Carolina, Greensboro, NC, January 16–February 20. Moody Gallery of Art, University of Alabama, Tuscaloosa, AL, March 6–April 6. “Abstract Painting and Sculpture in America, 1927-1944,” Museum of Art, Carnegie Institute, Pittsburgh, PA, November 5–December 31, 1983; San Francisco Museum of Modern Art, San Francisco, CA, January 26–March 25, 1984; The Minneapolis Institute of Arts, Minneapolis, MN, April 15–June 3, 1984; Whitney Museum of American Art, New York, NY, June 28–September 9, 1984. “Selected Paintings by Esphyr Slobodkina,” Sid Deutsch Gallery, New York, NY, January 5–30. “Esphyr Slobodkina: An Introspective,” Art and Cultural Center of Hollywood, Hollywood, FL, February 16–March 18. American 20th Century Art,” Sid Deutsch Gallery, New York, NY, December 1, 1984–January 2, 1985. The Metropolitan Museum of Art acquired The Pot-Bellied Stove. “Esphyr Slobodkina: Painting of the 40’s and 50’s,” Sid Deutsch Gallery, New York, NY, January 5–30. “American Abstract Artists 50th Anniversary Celebration,” Bronx Museum of the Arts, Bronx, NY, February 6–April 20. “American Abstract Artists: The Origins,” Hillwood Art Gallery, Long Island University, C.W. Post Campus, Brookville, New York, October. “American 20th Century Art,” Sid Deutsch Gallery, New York, NY. “Progressive Geometric Abstraction in America 1934-1955, Selections from The Peter B. Fischer Collection,” Fred L. Emerson Gallery, Hamilton College, Clinton, NY, September 26–November 7; Mead Art Museum, Amherst College, Amherst, MA, March 31–May 1, 1988; Terra Museum of Art, Chicago, IL, October 1– November 27, 1988; Fisher Gallery, University of Southern California, Los Angeles, CA, March–April 1989. “The Ebsworth Collection: American Modernism, 1911-1947,” Saint Louis Art Museum, Saint Louis, MO, November 20, 1987–January 5, 1988; Honolulu Academy of the Arts, Honolulu, HI, February 5, 1988–March 15, Museum of Fine Arts, Boston, Boston, MA, April 6–June 5, 1988. “American Abstract Artists: 50th Anniversary Portfolio,” James Howe Art Gallery, Kean University, Union, NJ. Creation of the mural Dialog of Diagrams for the Broward County Talking Book Library, Fort Lauderdale, FL. Celebration of her eightieth birthday with the private publication ofA Portable Library of Slobodkina’s Children’s Books. Donated 20 of her children’s books to the North Miami Public Library. “Urban and Suburban America,” Sid Deutsch Gallery, New York, NY, March 26–April 2. Received the Moretti Award for outstanding artistic achievement. Donation of the mural The Wonderful Feast (1988) to the Children’s Room of the North Miami Public Library. Trip to China in honor of the newly translated version of Caps for Sale. “Esphyr Slobodkina: Early (1938) and Recent (1988) Works,” a dual retrospective at the Sid Deutsch Gallery, New York, NY, January 7– February 1, and the Art and Culture Center of Hollywood, Hollywood, FL, January 12– February 26. “The Patricia and Phillip Frost Collection: American Abstraction 1930–1945,” National Museum of American Art, Washington, D.C., September 8, 1989– February 11, 1990. Traveled to the Nieuwe Kerk in Amsterdam, Holland, August 25–October 2, 1990. “The Federation of Modern Painters & Sculptors and the Arts Students League of New York,” The American Fine Arts Gallery, New York, NY, October 1–14. State University of New York at Purchase, Purchase, NY. “Late Nineteenth and Twentieth Century American Masters,” Sid Deutsch Gallery, New York, NY. Privately published The True Story of Polychrome. Creation of the collage mural Sleepy ABC for the Children’s Room of the Shaker Heights Public Library, Shaker Heights, OH. “A Point of View: 20th Century American Art from a Long Island Collection,” Heckscher Museum of Art, Huntington, NY. “Neuerwerbungen,” Galerie Lopes, Zürich, Switzerland, November 29, 1990–January 17, 1991. Moved to West Hartford, Connecticut with sister Tamara. “The Second Wave: American Abstraction of the 1930s and 1940s, Selections from the Penny and Elton Yasuna Collection,” Worcester Art Museum, Worcester, MA; Samuel P. Harn Museum, University of Florida, Gainesville, FL; Delaware Art Museum, Wilmington, DE. “The Life and Art of Esphyr Slobodkina,” Tisch Gallery, Tufts University, Medford, MA, January 16–March 29, and at the Sidney Mishkin Gallery, Baruch College, New York, NY, November 5– December 14. “Federation,” Krasdale Foods Gallery, New York, NY, April 10–July 9. “The Persistence of Abstraction: American Abstract Artists 56th Annual Exhibition,” Edwin A. Ulrich Museum of Art, Wichita State University, Wichita, KS, August 27–October 18. “Fables, Fantasies, and Everyday Things: Children’s Books by Artists,” Whitney Museum of American Art, New York, NY, November 22, 1992– January 31, 1993. “Esphyr Slobodkina and Friends,” Snyder Fine Art, New York, NY, December–January 9, 1993. Designed and oversaw the construction of the Slobodkina-Urquhart Children’s Reading Room at the University of Hartford, a building dedicated to children’s literacy and education. 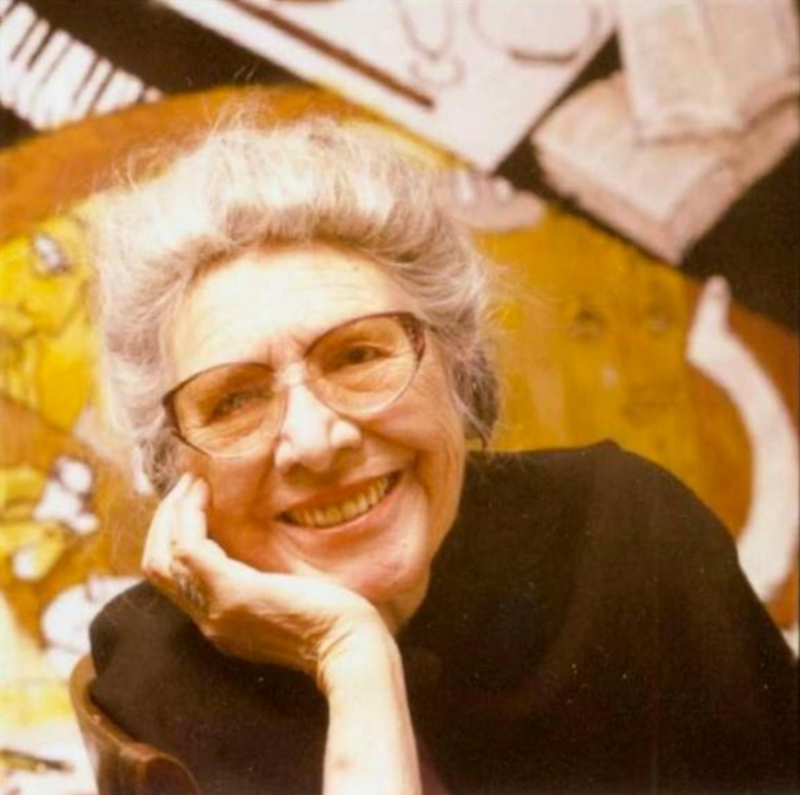 She donated more than $350,000 towards construction and decorated the interior with 26 cloth collages based on illustrations from Mary and the Poodies. 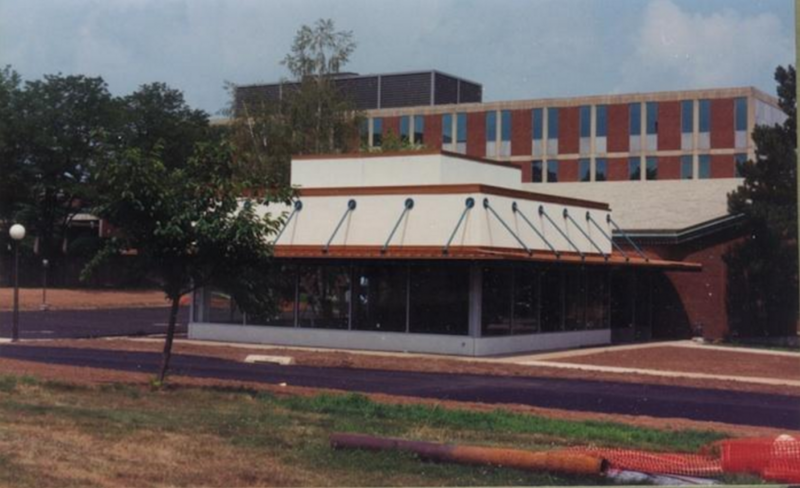 The building opened in March 1995 to enthusiastic reviews. “In the Beginning was the Sketch: An Exhibition by the Federation of Modern Painters & Sculptors,” Grace Gallery, New York City Technical College, Brooklyn, NY, February 4–26. “Aspects of American Abstraction 1930-1942,” Michael Rosenfeld Gallery, New York, NY, February 11– March 27. “Intimates and Confidants in Art: Husbands, Wives, Lovers and Friends,” Nassau County Museum of Art, Roslyn Harbor, NY, April. “The Uses of Geometry Then and Now,” Snyder Fine Art, New York, NY, October 29– December 4. “Miro and New York 1930-1950,” Washburn Gallery, New York, NY, November. “Significant Others: Artist Wives of Artists,” Kraushaar Galleries, New York, NY. “A Year From The Collection, Circa 1952,” The Whitney Museum of American Art, New York, NY, February 12–April 17. “Fables, Fantasies, and Everyday Things: Children’s Books by Artists,” Whitney Museum of American Art at Champion, Stamford, CT, October 14–December 30 (expanded version of the 1992-93 exhibition). Caps for Sale the musical debuted at the Wadsworth Atheneum in Hartford, CT to an overflowing audience that lined the blocks surrounding the museum. “Esphyr Slobodkina,” Snyder Fine Art, New York, NY, June 1–24. “1937: American Abstract Art” Snyder Fine Art, New York, NY, October. Returned to Great Neck, New York with sister Tamara. “American Vanguards,” Nassau County Museum of Art,” Roslyn Harbor, NY, January–April 28. “Community of Creativity: A Century of MacDowell Colony Artists,” Currier Gallery of Art, Manchester, NH, September 13–December 2; Wichita Art Museum, Wichita, KS, April 20–June 15, 1997. “Myth, Magic and Mystery: One Hundred Years of American Children’s Book Illustrations,” The Chrysler Museum, Norfolk, VA, June 1– September 8; Memphis Brooks Museum, Memphis, TN, November 3, 1996–January 6, 1997; Delaware Art Museum, Wilmington, DE, February 7, 1997– April 6, 1997. “Pioneers of Abstract Art: American Abstract Artists, 1936-1996,” Sidney Mishkin Gallery, Baruch College, New York, NY, September 20–October 17. “Art Today: An Exhibition by Members of the Federation of Modern Painters & Sculptors,” Fordham University, Lincoln Center, New York, NY, September 20–October 17. “American Abstract Artist 60th Anniversary Exhibiton,” James Howe Fine Art Gallery, Kean University, Union, NJ, November 23– March 1, 1997. Gifted 80 artworks by herself and Ilya Bolotowsky to the C.W. Post Campus of Long Island University and provided a grant to support art programs and create an on-campus studio for visiting international artists. Gifted 80 artworks by herself and Ilya Bolotowsky to the Heckscher Museum of Art in Huntington, New York. Museum opened the Esphyr Slobodkina Research and Study Center. “Art of This Century: The Women,” Pollock-Krasner House and Study Center, East Hampton, NY, July 31–October 31. This show traveled to the Peggy Guggenheim Collection, Venice, Italy from February 8–May 17, 1998. “Thinking in the Abstract: The Paintings and Sculpture of Esphyr Slobodkina,” the Heckscher Museum of Art, Huntington, NY, November 16, 1997–March 8, 1998. “Defining the Edge: Early American Abstraction, Selections from the Collection of Dr. Peter B. Fischer.” Laguna Art Museum, Laguna Beach, CA, January 10–March 15, and the Michael Rosenfeld Gallery, NY, March 26–May 30. “Esphyr Slobodkina: A View of the Collection,” Hillwood Art Museum, Long Island University, C.W. Post, Brookville, NY, April 20–June 28. Moved to Glen Head, New York. “Women Abstractionists of the 30’s, 40’s, and 50’s,” David Findlay, Jr. Fine Art, New York, NY, May–June 5. “World Artists at the Millennium,” September 11–October 18. Queen Illiana doll displayed in the United Nations Visitor’s Lobby, New York, NY. Established the Slobodkina Foundation in May. “Twentieth-Century American Art: The Ebsworth Collection,” National Gallery of Art, Washington, D.C., March 5– June 11; Seattle Art Museum, Seattle, WA, August 10– November 12, 2000. Slobodkina attended the exhibition ceremonies and dinner as an honorary guest. “The Subway Series: An Exhibition of the Federation of Modern Painters & Sculptors,” Fordham University, New York, NY, March 8–April 30. “Esphyr Slobodkina: An Artful Life,” Heckscher Museum of Art, Huntington, NY, May–June 25. “An Introspective Look at the Work of Esphyr Slobodkina,” Great Neck Center for the Arts, Great Neck, NY. “Michael Rosenfeld Gallery, the First Decade,” Michael Rosenfeld Gallery, New York, NY, May 11–August 10. “Toward the New: American Abstract Artists,” Hillwood Art Museum, Long Island Art Museum, C.W. Post, Brookville, NY. “American Modernism, 1930s & 1940s Abstraction,” David Findlay Jr. Fine Art, New York, NY. “From Church to Dove: One Hundred Years of American Painting from the Heckscher Museum of Art,” Berry-Hill Galleries, New York, NY, November 28,2001– January 3, 2002. Dies at age 93, two months shy of her 94th birthday. “Modernism and Abstraction: Treasures from the Smithsonian American Art,” a traveling exhibition organized by the Smithsonian American Art Museum, Washington, DC. “Esphyr Slobodkina: Diversity,” Kraushaar Galleries, New York, NY, February 16 –March 23. On March 20, Dr. Gail Stavitsky, Chief Curator at the Montclair Museum, New Jersey, delivered a lecture about Slobodkina’s relationship to the New York art abstract movement. Nails (1978, mixed media) installed in the official residence of the United States Consul General to Hong Kong as part of the U.S. Department of State’s ART in Embassies program. “Esphyr Slobodkina: Abstractions,” Hillwood Art Museum, Long Island University, C.W. Post, Brookville, NY, March 3–April 12. “Two Friends,” Great Neck Arts Center, Great Neck, NY, June 5–July 13. “Esphyr Slobodkina: Journey into Abstraction,” Kraushaar Galleries, New York, NY, October 1–30. 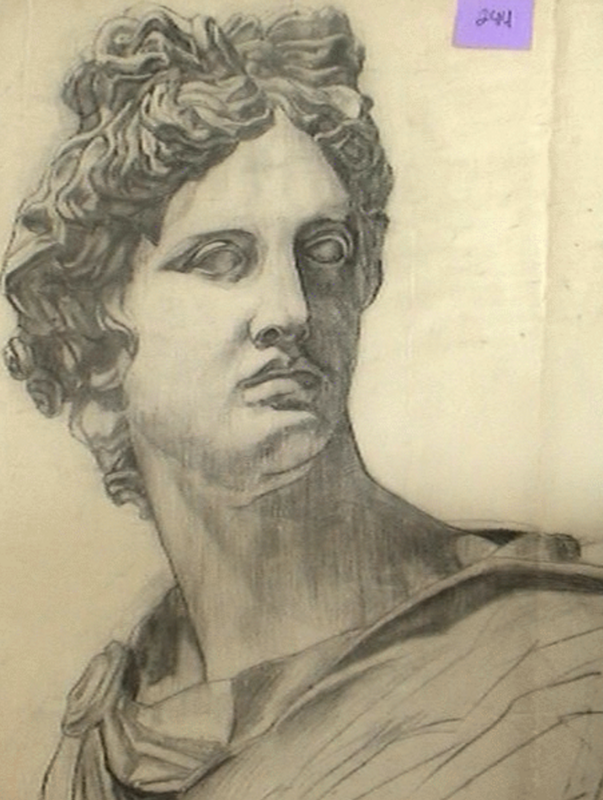 “A Century of Collecting,” Heckscher Museum of Art, Huntington, NY, September 18–November 14. “Abstract Paintings by Esphyr Slobodkina,” Valerie Carberry Gallery, Chicago, IL, November 12, 2004–January 29, 2005. “The Picture Book Made New: Margaret Wise Brown and Her Illustrators,” The Eric Carle Museum of Picture Book Art, Amherst, MA, March 29–July 10. “Evolution in Abstraction: Antecedents and Descendents,” D. Wigmore Fine Art, New York, NY, April 15–May 31. “Continuum: In Celebration of the 70th Anniversary of AAA,” St. Peter’s College Art Gallery, O’Toole Library, Jersey City, NJ, March 21–April 25, 2007. “Michael and Marilyn Gould Collection of American Modern Art (1918-1949),” New Britain Museum of American Art, New Britain, CT, July 13–November 4, 2007. “Black + White: A Selection of 20th Century Drawings and Prints,” Kraushaar Galleries, New York, NY.